I threw a birthday party for my son's 7th and nephew's 5th birthday. I had no wrapping paper for gifts and did not want to buy any. I'm really happy with the way they turned out! All you need is newspaper and hemp chord. It doesn't get any easier than that! I'm still recovering from the festivities. I will post about that soon!! I love how your wrote the names right on the paper. Brilliant because now you don't need tags either! What a great idea!! It always seems such a waste to buy wrapping paper that gets ripped up and thrown away! Hi Jill, thanks. I will definitely link up!! 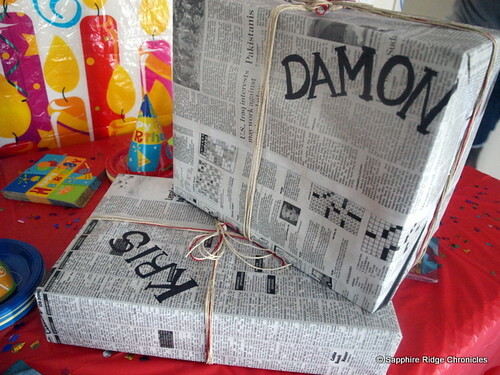 Very cool, I try and not buy wrapping paper as much as possiable. After Christmas one year, I got a good deal on beautiful ribbon. The next year all my gifts were wrapped in brown wrapping paper ("these are a few of my favorite things") and the beautiful wide ribbon. For the name tags, I glued a piece of the ribbon to card stock scraps and used my TO and FROM stamps. They turned out wonderful, cheap, easy, and unique! Love this idea, and Im all about eco friendsly things. 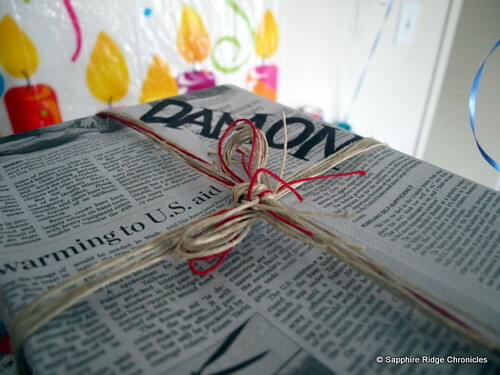 I have wrapped many presents in newspaper. You go girl!!! i LOVE wrapping with recycled stuff... "real" wrapping paper takes up so much room :) come on over and link up to MMM! very cute idea! I love how you included their name! Way cute! and such a super creative idea!! Be sure to link up to my FFF's party at FrouFrouDecor this Friday! Have a sweet day! i'm featuring this next week :) thank you for linking up to MMM! Very cool! Looks fabulous too! @Terrell I'll be sure to come on over! @C.R.A.F.T thanks so much for the feature I'm so excited! Great $$$ saver! Thanks for linking up to Mad Skills Monday! Loving this fabulous find!! Thanks a ton for linking over at Frou Frou Decor today!! Have a great weekend! So cute - great idea !!! Thanks for the inspiration and linking this up to Socialize with me Monday til Sunday. Great idea! This is so cute! I hope you'll stop by and share this (or any other cute packaging idea) at the Pretty Packages Party!